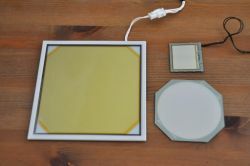 Lumiotec started shipping their OLED Lighting kits back in February 2010. We were finally able to get our hands on one, and here's our hands-on review. 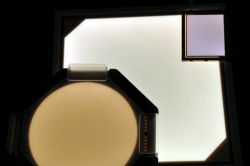 We have already reviewed the Philips Lumiblade and the OSRAM ORBEOS panels, and we'll compare them all in this review. 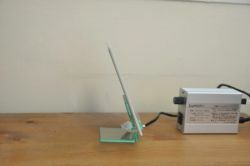 The kit includes one OLED panel, a controller, a stand, a power adapter (with a nice plug adapter). You also get a couple of user manuals which explains all about the OLED panel and controller. 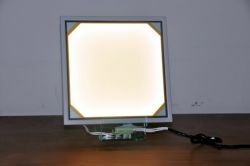 The OLED panel is 145mmx145mm (the active light emitting area is 125mmx125mm). The panel is 4.1 mm thick (but the frame is 4.8mm thick). The OLED weights 195 grams and the the maximum brightness is 4,000 cd / m2. The lifetime is quoted at 30,000 hours (at 1,000 cd / m2 brightness level) and the efficiency is low - about 11lm/W. The controller is just what you'd expect - power goes in from one side, and a short cord can be connected to the OLED panel. You can turn it on or off, and there's a dimmer switch. The controller is large and looks professional - but the power adapter is large and it makes the whole kit very bulky. 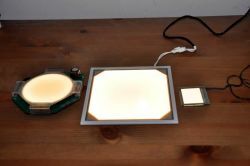 I prefer OSRAM's battery-powered OLED kit, although the Lumiotec panel will be easier to integrate into actual lamp designs, I think. The OLED panel itself is very impressive. It's large and looks great. Even my wife said it's cool (and that says a lot). In fact the whole kit feels very professional and high-quality. The stand is a very nice touch, too. The kit costs ¥84,000 (about $930). 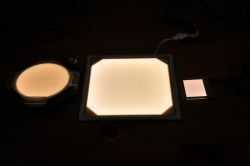 This is more expensive than OSRAM's kit (€240, or $323) and Philips' Lumiblade for which the controller costs €70 ($94) and the OLEDs cost between €70 and €500, depending on the size and shape. When you turn it on, the panel is quite bright. I think that one of these is enough to be used as a desk lamp - but you'd need more than one (probably more than 3, really) to light a small room. 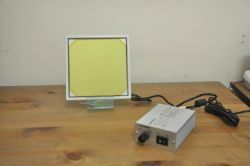 The light is white (temperature is 3800k-4000k) and has a similar color to the Philips' white panel (the ORBEOS is more yellow). After a short while, the panel gets hot. Really hot. We were always told that OLED emits no heat, but this isn't true in this case. The same thing happens with the Philips panel. The ORBEOS stays cool though. Maybe it's got to do with the driver and power and not the OLED emitter itself. 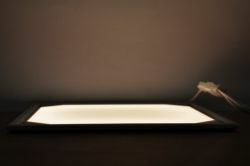 Lumiotec is the third company to offer panels - after Philips and OSRAM. The Lumiotec panel is much larger and brighter than the two older OLEDs, and is much more impressive. It's also thicker though, and much heavier. The Lumiotec OLED panels are large and bright - in fact these are the largest and brightest OLEDs you can buy. They are also more expensive than the alternatives. If you're looking to design a lamp that can actually be used for general illumination and can incorporate a large OLED panel than then this is the top choice. If you're looking to design an art piece or niche illumination, then maybe the Philips or OSRAM panels will be better.